It is with sadness that we notify you that Mrs Maragaret McGreade wife of the late 22115128 CSgt Raymond McGreade died on 23 April 2013. It is with regret that we inform you that 14189210 Pte Harold James MANNING of Allenton, Derby died on 31 March 2018. Jim was called up to the General Service Corps and after training was posted to the 1st Battalion The Sherwood Foresters during World War 2 and in March 1948 transferred to the Army Air Corps (Parachute Regiment where he served with 7 Para (Light Infantry). The funeral of 14189210 Pte Harold James MANNING is to take place at Markeaton Crematorium, Derby on Friday 27 April 2018 at 1320 hours. Members and Standards welcome. It is with regret that we inform you that 22800796 Sgt Terence Henry MARKHAM of Benfleet Essex died on 1 May 2018 aged 82. Terry first enlisted into the Infantry Boys Battalion in April 1952 before being posted to the Sherwood Foresters at Normanton Barracks in September 1951. He was then posted to the 1st Battalion at Derna, Middle East Land Forces in March 1954. He continued to serve with the 1stBattalion in Sennelager, Malaya, Singapore, N Ireland, Colchester, Cyprus and Munster until his discharge in 1968. After leaving the Regiment he served with 5thBattalion RRF (TA) 1969 – 1972, Australian Citizen Military Forces in Sydney NSW with 4th RNSW Regt and again with 5 RRF 1975 – 1977. The funeral is to take place at Pitsea Crematorium, Church Rd, Pitsea, Basildon, Essex SS13 2HG on Tuesday 29 May 2018 at 1510 hours. No flowers but donations to SSAFA or Essex Air Ambulance. transferring in 1972 to the Royal Hampshire Regiment. He served with 1 FORESTERS and 1WFR in UK, Cyprus and BAOR and NI and Hong Kong with 1R HAMPS. Funeral details will be promulgated when known. We regret to announce the death of 24017188 Sgt David MARTIN of Gosport aged 69 on 11 May 2016 while on a visit to Worcester. He enlisted in The Worcestershire Regiment in 1964 joining the 1st Battalion in Lydd and served with it in Gibraltar, Tobruk and Cyprus and with 1st Battalion The Worcestershire and Sherwood Foresters in N Ireland, Berlin then as a PSI with 1 Mercian Volunteers in Nottingham before discharge in 1979. Funeral arrangements in Gosport to be confirmed. It is with sadness we notify you that 25025949 Pte Daniel McGEADY died on 17 July 2015 aged 41. Daniel enlisted into the 1st Battalion The Worcestershire and Sherwood Foresters Regiment in 1993 and left the Army in 2003. It is with sadness that we inform you that 5254616 Pte Edgar MERREY of Sudbury, Derbyshire died on 22 August 2015 aged 97. Edgar served with the 7th Battalion The Worcestershire Regiment during WW2 and took part in the Battle of Kohima in 1944. He also served in Egypt and survived when his ship was torpedoed in the Mediterranean Sea by Italian Dive Bombers. In his later years he has been to Kidderminster and Worcester several times. His funeral is to take place on Wednesday 9 September 2015 at 1130 hours in All Saints Village Church, Main Road, Sudbury DE6 5HT. Standards would be welcome. It is with regret that we announce the death of 24380972 Sgt Peter Francis MIDDLETON of Newark on 23 December 2017. Ginner, as he was known, served with 1st Battalion The Worcestershire and Sherwood Foresters Regiment from 1977 to 1993. He served in Belize with C Coy then later with A Coy before being appointed Provost Sgt. Funeral details will be published when notified. It is with regret we inform you that Pte 19190472 Ronald Frederick MILLS of Derby died on 13 December 2013 aged 84. Ron was called up for National Service into the General Service Corps on 3 July 1947 and after training at Elgin in Scotland was posted to The Sherwood Foresters. In January 1948 he was posted to the Lincolnshire Regiment and served in Palestine before leaving the Army in 1949. Ron was a staunch member of Derby Branch WFRA. His funeral is to take place in the Main Chapel, Markeaton Crematorium, Derby on Tuesday 24 December 2013 at 1000 hours. Standards welcome. Family flowers only but donations if desired may be sent payable to G Wathall & Son Ltd 101 Macklin Street, Derby DE1 1LG to Ron’s chosen charities; Treetops Hospice, MacMillan Cancer Support and The Royal British Legion. Mourners are invited to meet with the family at The Chellaston Social Club, 12 Derby Road, Chellaston DE73 6RA after the committal. It is with regret we inform you that 22663986 Harold Millward of Congleton died on 18 August 2015 aged 81. He was called up as a National Serviceman in 1952 and after basic training joined 1st Bn The Worcestershire Regt in Malaya. On the battalion's return to UK he spent the last few months of his service at Bulford. The funeral will take place at St Peter's Church Congleton CW12 4AB at 1315 hours on 8 September. It is with regret that we inform you that 23213609 WO2 Dave MOORE of Pershore died on Tuesday 17 January 2017. He enlisted in the Worcestershire Regiment in 1953 and served with 1 Worc R in BAOR, the West Indies,Gibraltar and Cyprus, his final tour before discharge in 1972 was as CSM C Coy in Warminster and NI. His funeral will be a private cremation followed by a Service in Pershore Abbey, Church Street, Pershore WR10 1DT at 1430 hours on Tuesday 14 February 2017. Standards, Bugler and Association Members welcome. It is with regret that we inform you that 2nd Lt John Gerald MORTIMER of Derby died on 30 December 2013 aged 77. John was commissioned into the 1st Battalion The Sherwood Foresters as a National Service Officer in July 1956 and served in Germany before he retired in September 1957. He became a teacher in civilian life before moving to the Sports Desk of the Derby Telegraph in July 1970 retiring in 2002 as Editor and Chief Sports Reporter. His funeral is to take place at Markeaton Crematorium on Tuesday 14 January 2014 at 1040 hours. It is with regret we inform you that 4977535 Pte Michael Vincent MURRY of Nottingham died on 8 February 2016. Mick enlisted in 1939 into 1st Battalion The Sherwood Foresters and served with A Coy as a driver. He was taken PoW on the fall of Tobruk in June 1942 and became prisoner number 29999. He was initially held at Benghazi before being moved to Italy and then Germany. He was held in various camps, last known being Stalag 344 at Lamsdorf. Mick worked in coal mines in Poland and was on the long march as the Russians advanced. He was repatriated in 1945 then transferred to the Royal Artillery Garrison Regiment before transferring back to the Sherwood Foresters in July 1946. Mick was then discharged to the Reserve on 19 August 1946. He was recalled and served in Korea with the Royal Northumberland Fusiliers 1950 - 51. Mick was a long time member and President of Nottingham City Branch WFRA. His Funeral is to take place at Wilford Hill Crematorium on Thursday 18 February 2016 at 0900 hours. Standards welcome.. It is with regret that we notify you that 24373416 CSgt Jeffrey NEWALL of Mansfield, Nottinghamshire died on 13 April 2017 aged 59. Jeff joined the Worcestershire & Sherwood Foresters in 1975 where after training he joined the 1st Battalion in Northern Ireland serving in B Coy. In 1980 after completing Junior Brecon he was promoted to Cpl, still with B Coy as a Section Commander and in 1984 became the Bn Weapon Training Instructor. He left the Army in March 1989 but re-enlisted in April 1991 and re-joined the Bn in Cyprus, returning to the Training Wing. In 1992 he was promoted to Sgt and moved to Milan Pl. He was posted to Depot in 1995 as Provost Sgt and returned to the Bn in Tidworth in 1997 as QM’s Ration Sgt. Jeff was promoted to CSgt in 1998 acting as Rear Party CSM whilst the 1st Bn was deployed in Bosnia. He was discharged from the Army in July 1999. The funeral is to take place at Mansfield Crematorium at 1230 hours on Monday 8 May 2017. The family would appreciate Association members and Standards attending. A celebration of Jeff's life is to be held at Mansfield Town Football Club after the Service. Anyone wishing to attend is asked to contact Steve Cheeseman on 07977038458 or stevencheeseman62@gmail.com. It is with sadness that we inform you that 24312637 Pte Steven NEWBOLD of Burton on Trent died on 8 January 2016. Steven enlisted in The Worcestershire and Sherwood Foresters Regiment in 1973 and served with B Coy. He left the Army in 1976. His funeral is to take place on 21 January 2016 at Bretby Crematorium, Geary Lane, Bretby, Burton on Trent, Staffs DE15 0QE. Standard Bearers would be appreciated by the family. It is with sadness that we inform you that 500939 Maj Kenneth William NOAKES died on 8 March 2017 aged 84. Ken enlisted in the ranks as a national service soldier in 1951 and served with the 1st Battalion South Staffordshire Regiment. On leaving the regulars in 1953 he joined 5/6th Staffordshire Regiment TA later rebadging to Mercian Volunteers. In 1971 Ken was instrumental in forming the Light Infantry Mercian Volunteers at Whittemere Street Walsall, which in turn became the newly formed 2 Mercian Volunteers where Ken was RQMS. He was commissioned to Lt with 2 Mercian Volunteers and went on to become Captain (QM). When the Mercian Volunteers reverted back to county Regiments, Ken transferred to 4 WFR attaining the rank of Maj (QM) serving at Hazlucks Green, Shirley and North Moons Moat at Redditch. The funeral is to take place at Streetly Crematorium, Little Hardwick Road, Aldridge, Walsall WS9 0SG on Monday 10 April 2017 at 1500 hours and after at Longhorn Pub, Sutton Road, Walsall WS5 3AR. Standards welcome. No floral tributes required but there will be a collection box at the Crematorium for donations to St Giles Hospice, Walsall. It is with regret that we inform you that 24243192 Private Reginald John Noble of Nottingham passed away peacefully in his sleep at 05.00 Hrs on Monday 15th December 2014 in Nottingham City Hospital. He may not have any surviving Family so there are no details for the funeral as yet, but as soon as they are known we will let you know. Reg joined 73 Engineer Regiment (V) on its formation in 1969 at Wigman Road Drill Hall, Bilborough before transferring to D. (Robin Hood Foresters) Company 3rd Battalion Worcestershire and Sherwood Foresters Regiment at the same location in May 1971, then moving with D. Company 3 WFR in 1975 to Broadgate Drill Hall, Beeston where he continued to serve until discharged in May 1981.
be laid to Coys whose exact positions were still unknown. Under continuous and heavy shell and mortar fire of the whole area, this NCO led a line party which worked all night and finally succeeded in establishing communications forward. By the time the battle reached Imigshot on the 18 Feb, the line section was becoming very tired, so he frequently went out, always under heavy fire, to reestablish contact with the Coys. This was done entirely on his own initiative, and reported to the Signals Officer only after the task had been completed. The success of this series of operations was done in no small part to the maintenance of communications. Sgt Norton by his personal effort, initiative and courage during this very strenuous and trying period so helped to inspire his platoon that operations never suffered for lack of communications.” Jim was also Mentioned in Despatches and awarded a C-in-C’s Certificate. ...It is with sadness we inform you that 24276724 Sgt Stephen NURSE of Rheindahlen, Germany died on Sunday 11 November 2012 aged 59. Stephen enlisted into 1st Battalion The Worcestershire and Sherwood Foresters Regiment in March 1976 and was employed as a clerk. Ex Pte Bradley PAUL who joined the 1st Battalion The Mercian Regiment and deployed to Afghanistan in October 2012 where as the front man of his patrol, every day he carried the weight of responsibility for the lives of his comrades on his shoulders every time he stepped out the gate. Unfortunately on 9 November 2012 Pte Paul he was struck by an IED and sustained life changing injuries. However, through strength of character and with the love of those around him, he made a good recovery. Sadly, he passed away on Tuesday 17 February 2015. As Pte Paul is no longer a serving soldier, his funeral costs will be paid for through non public funds only. His family have set up a Go Fund Me web page at http://www.gofundme.com/bradpaul Any funds remaining after the funeral will be given to Combat Stress and put in a Trust for his younger brother as an equal split. It is with regret that we inform you that 24303208 LCpl Graham PITCHFORTH of Kidderminster died on 11 December 2015 aged 59. Graham enlisted into The Worcestershire and Sherwood Foresters Regiment in August 1972 and served until May 1987. It is with regret that we inform you that 22392976 CSgt G Pool of Manton, Worksop died on 25 December 2014 AGED 86. 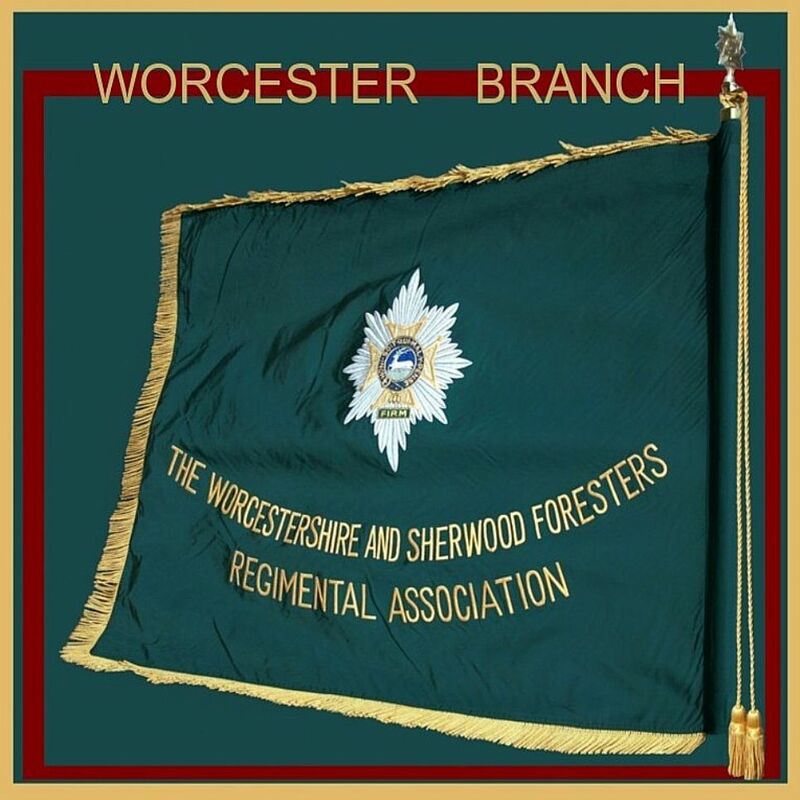 CSgt Pool joined 3rd Battalion The Worcestershire and Sherwood Foresters Regiment in 1973 and left the Army in 1979. His funeral is to take place on Monday 12 January 2015 at 1400 hours at Ollerton Crematorium following which there will be a gathering of mourners at THE STATION HOTEL , Carlton Road, Worksop from 1500 hours onwards. It is with regret that we inform you that 23548836 Pte Brian Thomas POULTON of Stourport died recently. Brian enlisted into 1st Battalion The Worcestershire Regiment on 24 April 1955 and was discharged on 23 March 1964. He saw service in the West Indies, British Guyana and UK. His funeral is to take place on Wednesday 8 June 2016 at 1100 hours in Wyre Forest Crematorium, Minster Road, Stourport on Severn DY13 8DE. The family would welcome Association Members and Colleagues but request no Standards. It is with regret that we inform you that 24438856 LCpl Brian Edward POYNER of Worcester died on 27 January 2018 aged 57. Brian enlisted into 1st Battalion The Worcestershire and Sherwood Foresters Regiment in 1977 and served with it in Belize, Colchester and BAOR until discharge in 1981. The funeral is to take place at Worcester Crematorium, Tintern Avenue, Worcester WR3 8HA on 9 March 2018 at 1510 hours followed by a wake at Barbourne Ex-services Club, The Moors, Worcester WR1 3ED. Association Members and Standards welcome.. Letters of condolence may be sent to his widow, Mrs Sue Poyner, at 5 James Close, Worcester WR1 2BG. It is with sadness we report that 4987723 Samuel J PRICE of Derby died on 30 December 2011 aged 80. Sam enlisted into the Sherwood Foresters Regiment Band as a Band Boy aged 16 in 1947. He then served with 2nd Battalion Sherwood Foresters until being medically discharged as a Sgt in Germany. His funeral is to take place at Wilford Hill Crematorium, Nottingham on Friday 13 January 2012 at 1140 hours. His son (Ex Sgt Jim Price WFR) would appreciate it if Standards could be in attendance. It is with regret that we report the death of 25169707 LCpl Gordon Quigley 1 MERCIAN who was killed in a road traffic accident on Sunday 15 April 2012 Funeral details will be promulgated when known.